As of late we’ve been hearing about a WWE coin collection in the works (thanks to WDN readers Nick Pavao and “K-Audio 85”) with an unknown link to the company’s Home Video division. Today that’s confirmed to be part of an Amazon-exclusive WrestleMania 33 DVD! 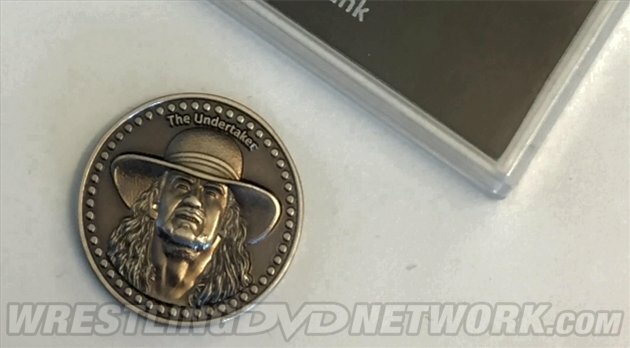 This exclusive version of the 3-disc WrestleMania DVD will include both the Undertaker coin and a display case that holds the “WWE: Official Coin Collection 2017”. 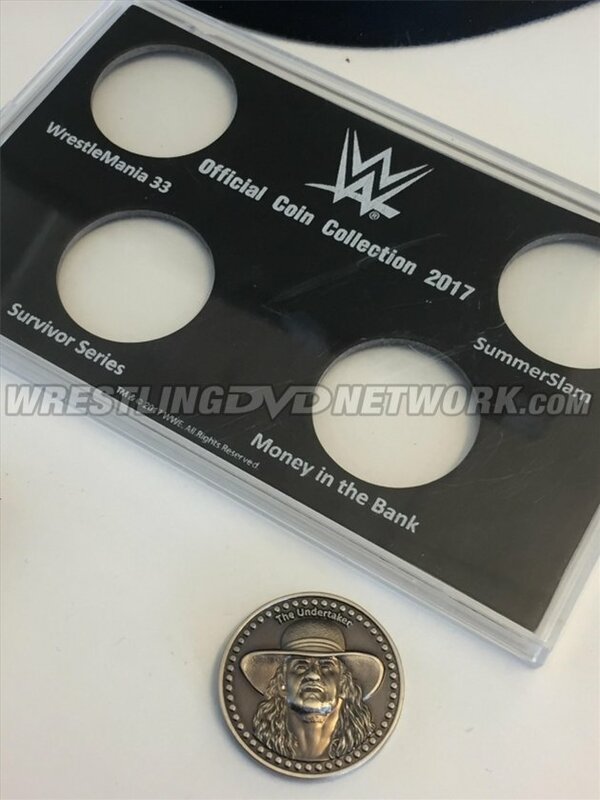 A further three coins will be available in Amazon-exclusive versions of the Money in the Bank 2017, SummerSlam 2017 and Survivor Series 2017 DVDs released later in the year. Early indications suggest that this limited edition offering will only be produced and sold in Canada. However, it is possible for fans in the United States to grab the set if purchasing online. Amazon.ca has the exclusive listed now with a scheduled release of May 16th. Get the Exclusive 2017 WWE Official Coin Collection Case and first coin (Undertaker/WrestleMania 33) with the purchase of WrestleMania 33. Complete your 2017 collection with the future releases of Money in the Bank, SummerSlam & Survivor Series. The Superstars of RAW and SmackDown Live reach the pinnacle of sports entertainment by competing on The Grandest Stage of Them All WrestleMania! With the WWE Universe watching, who will win WWE championship gold and achieve immortality? The same survey asked fans to respond on their likelihood of purchasing a DVD/Blu-ray title that contains content that’s also available on the WWE Network, and how this might change if the DVD set included an extended version of what’s on the Network or other “unseen footage”. On that subject, while we know that a Kurt Angle documentary is happening in the form of an upcoming “WWE 24” special, the recent survey of potential WWE DVD concepts appears to hint that an expanded version of the Angle documentary might see a Home Video release in 2018! After almost a decade away from WWE, Kurt is finally back home. 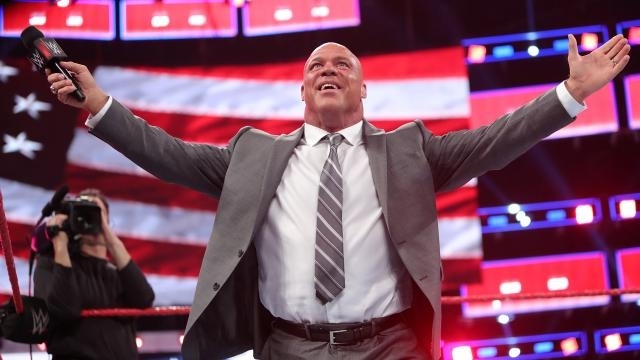 Hear from Kurt as he discusses the personal issues that lead to his departure, witness his meetings with Vince McMahon & Triple H for the first time in years, and follow Kurt’s full journey to the Hall of Fame. Kurt makes clear his strong desire to come back and rewrite the ending of his career, and this was the first step. WWE’s next DVD/Blu-ray documentary will be “Fight Owens Fight – The Kevin Owens Story”. The International Wrestling Syndicate (IWS) out of Canada, where Owens spent much of his early wrestling career, have posted an exclusive new teaser trailer (below) for the documentary and thanked WWE for “loading the DVD with IWS footage and interviews”. As you may recall from the content listing, IWS actually has its own extra on the KO-DVD. – UK/Europe: July 3rd. Pre-order the Kevin Owens DVD/Blu-ray soon via Amazon.co.uk. – USA: July 4th. Pre-order the “Fight Owens Fight” DVD or Blu-ray soon here on Amazon.com. – Australia: TBA. Look for your chance to pre-order a copy over at Madman.com.au. “Double Feature: Elimination Chamber & Fastlane 2017” will officially release to fans in the UK this coming Monday — grab the DVD pack now here on Amazon.co.uk. 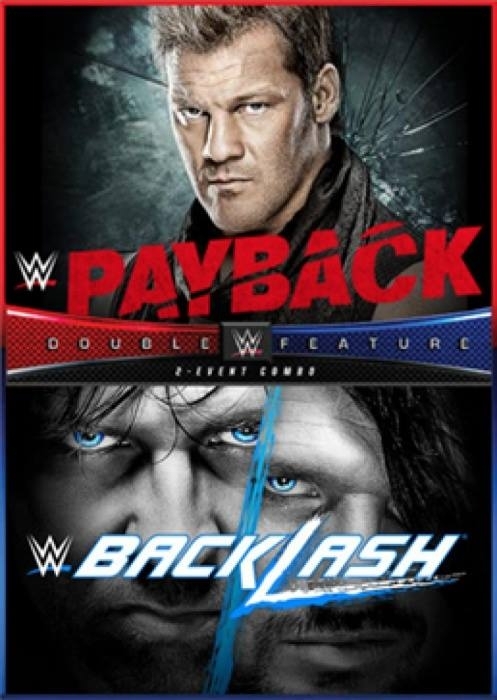 “Double Feature: Payback & Backlash 2017” is next up for the 2-disc PPV DVDs, which will combine this Sunday’s RAW-exclusive event with next month’s SmackDown-exclusive event. 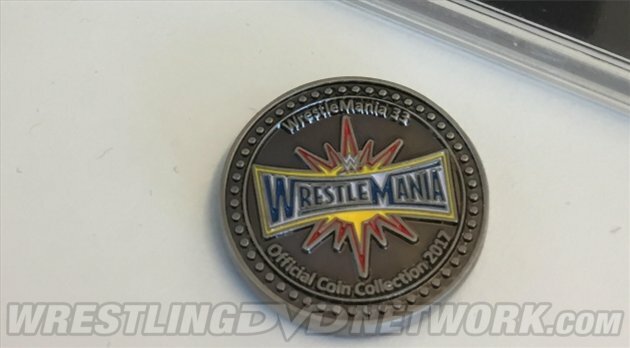 I’m not buying Mania 33 because of a collectible coin… lol. M.I.T.B. instead of Rumble? Guess the coin set wasn’t planned out. Run-time of discs were way over 2 hours each. Many extras and they exciting and gave meaning.